The department of management organised an International Expert talk on the topic “Learning in a Dynamic Global Environment”. This session was held on 18th February,2019 at the Mini Auditorium 2 exclusively for the first year BBA students. The guest speakers for the day were Dr.Per Markus Anderson, Associate Dean for Global Learning Concordia College, Minnesota, USA and Prof.Christopher J.Mason, Interim Director, Offutt School of Business. The former started the session by explaining about globalisation and its great impact on day to day living. He mentioned that the world is interdependent and emphasized on “Serving” rather than being served using a biblical reference which states “Love your neighbour as you love yourself”. Dr Anderson was followed by Prof. Mason who enlightened the gathering about the history of Offuttt school of Business. Further, he explained about entrepreneurs and referred to them as “Risk takers”. He also elucidated some characteristics of an entrepreneur like opportunity prioritising, problem solving and precision of decisions. The speakers concluded the session by highlighting the concept of ‘’Ethical Decision making” through a short story of Ryan Potato. The session proved to be really motivating and productive for the students to adapt constant learning in a dynamic environment. The Department of management organized a guest lecture on Saturday, 2 February 2019 at 12.00 pmfor the first year students of BBA in Main Auditorium .The guest lecture was on the topic "an overview of corporate culture". The guest for the day was Mr. Sandeep Titus, marketing manager, ARDEX endura, Bangalore. He began with a moral story of water bug's transformation into dragon fly which inspired the students to incorporate such transformation in their lives. 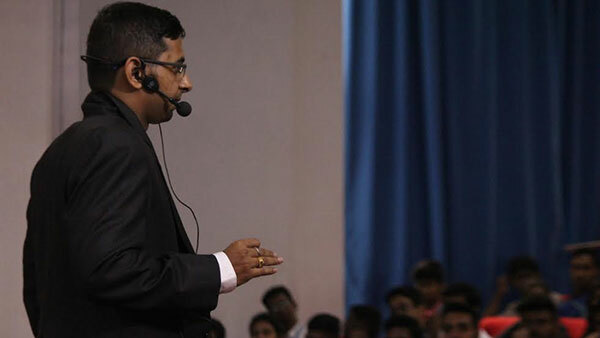 Mr. Titus enumerated various aspects such as dealing with expectations, networking and growth. The guest also conducted various activities, one of them being, a questionnaire consisting of 10 questions which constituted different aspects of psychological significance. Being an alumni of Kristu Jayanti College, he had an interactive session with the students about his experience. To conclude the session, Mr. Surendranath Reddy, the head of the department handed over a memento to Mr. Sandeep Titus, as a token of gratitude. On the whole the session proved to be really inspiring and motivating to the students. The department of management organized a guest lecture on Saturday, 2nd February 2019 at 11.00 am in the main auditorium exclusively for the students of BBA Aviation management and Business Analytics. The guest for the day was Ms. Neethu Madhu, Financial Analyst, Wells Fargo EGS. She joined as an associate Financial Analyst in the year 2017 and got promoted to Financial Analyst role within a year. The chief guest began by stating the importance of Current affairs Hour that is scheduled apart from the subjects and the necessity to know the happenings around the world. “Every news matters” she said, pointing out how important it is to have knowledge of current affairs in order to be able to confidently step into the corporate work environment. She also insisted that good communication skill is very essential to be able to work in the corporate world, without which the students’ ability cannot be recognized. She also pointed out certain skills required to crack interviews like good knowledge about the current affairs and past of the company, knowledge about the post that you have applied, good communication skills and attitude. Ms. Neethu also shared her experience of how she was able to get through her interview because of the research she had done prior. She encouraged the students to actively take part in the cultural programs as such opportunities prove to help in development of one’s personality. She elucidated about the scope of aviation management in terms of masters like Aviation strategic management, Airport design and development, Aircraft safety, Air traffic control, Commercial aviation and so on. She also highlighted the importance of finance in a company and the role of financial analyst in every company. She mentioned how the banking sessions held in Kristu Jayanti College have helped her build up skills in accounting and finance. The session came to close with a team building activity conducted by the guest for the students. As a token of gratitude, Mr. Surendranath Reddy, the Head of department management, handed over a memento to Ms. Neethu Madhu. On the whole, the session proved to be really informative and inspiring for the students. Set your Goals high and don’t stop till you get there. The department of Management Kristu Jayanti College never stops setting its goals high and also encourages students to progress every day to reach their goals. One such session was the International Guest Lecture on “Dynamics of Global Supply Chain Management” which was organized for the VIth Semester BBA Students on 12th December 2018 at 11:00AM in Mini Auditorium III of the college. The guest speaker for the day was Dr. Dinesh S. Dave, Professor and Head, Department of Computer science and Supply Chain Management, John A Walker College of Business, Appalachian State University, North Carolina, USA. The session began with Dr. Dinesh addressing the gathering on Supply Chain Management and its scope in Corporate Industries like manufacturing and e-commerce. Dr. Dinesh also spoke about the recent trends and challenges that organizations face in order to meet the demand of the customers. The highlight of the lecture was discussion about EPIC Framework which stands for Economy, Politics, Infrastructure and Competence. Dr. Dinesh also shared the comparative advantages that India has with other countries like china, USA etc. He also threw light on comparative analysis related to past, present and future economic development of the country like GDP, Inflation and its relevance in Supply Chain Management. He also shared some of the examples from companies located in North Carolina on how they manage their SCM and when it comes to India he said Infrastructure facilities has to be improved in order to have a better development. The session ended up with student interaction which gave them an idea of SCM and its Operations in India and other countries like USA and China and also about the various opportunities available in the market. The Department of management never fails to bring all the possible brightness for their students. 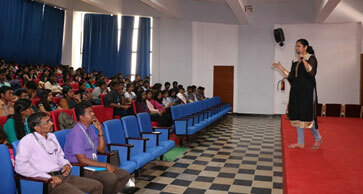 One such session was the International guest lecture on Career Excellence in International Environment. This session was organized for the IV Semester BBA students on 28th November, at 2pm in the Mini Auditorium 3 of the college. The guest speakers for the day were Prof. Ruth Wallace, Dean of College of Indigenous futures, arts & Society, Charles Darwin University, Australia and Prof. Ganesh Koramannil, Research Scholar in College of Indigenous futures, arts society, Charles Darwin University. The session began with Prof. Ruth addressing the gathering. She introduced Charles Darwin University and the various deaneries of their university. Prof. Ruth also emphasized on the concept of research and its scope in the future. She also mentioned about qualities such as Innovation, problem solving ability, creativity which are important in a potential employee, besides the grades for the dynamic environment. Prof. Ruth was followed by Prof. Ganesh Koramannil who enlightened the gathering about Australia culture and the similarities between the Indian and Australian culture. He also shared his experience being an Indian in Australia and how Australia enabled him to realize his potential. He concluded with a session with the students and encouraged them to consider Australia as one of their international options for further studies and Opportunities. The session ended on a high note and brought a new fire among the students for developing their career prospects. In the words of Benjamin Franklin thirst to acquire knowledge marks the first step towards success. With this note in mind Mr. Abhishek Kumar Srivastava, Senior Executive Manager , Infosys delivered a talk on “Preparation to embark the corporate world” to the final year students organized by the Department of Management (BBA) on the 4th of August’18. The talk pondered around various aspects that help one kick starting his/her career and move up the hierarchy. He stated that creativity is what makes you stand out and interest paves one's path to success. Constantly acquiring knowledge and enhancing thinking skills helps an individual to think with an innovative mind. Quoting various examples from his own life, Mr. Abhishek made the session highly interactive as he shed light on the specializations opted by students i.e. Human Resource, Marketing and Finance and what are the various other career options falling under these heads. Towards the end of the session he motivated the students to open a DEMAT account as a basic stepping stone into the corporate sphere and inculcating a sense of individuality. He was open to questions and provided his opinions on the role of Artificial intelligence in the near future and how it would mould the global village. The feedback from the students led to the success of this session where the students stated it as an eye opener. The department has organised ‘Meet Your Alumni’ on 7th July, 2018 as part of interaction between students and alumni. The session was commenced with a brief introduction of Mr. Manish. He shared some glimpse of these college days in Kristu Jayanti College and how the management events experiences made a wider impact on his career. He discussed ‘The art of carving opportunities out of challenge’, He put up a self-reflection question by asking ‘Does your brand stand out from the rest?’.. He also shared his experience as a student of Management discipline and his participation in management fests, department activities and college programs. He suggested the students to invest time cleverly for overall growth during three years of their stay at college. The Question answering session was there were students could come up with their doubts and clarified. The session was ended by 12.50 pm. Majority of the students felt that the lecture & presentation was enlightening and useful. They also agreed that the information delivered by the resource person was new to them and the presentation was relevant. The students appreciated the content of the presentation and the Q & A session facilitated by the speaker. As a downside students were not appreciative of the use of ICT to the extent expected. The department has organized ‘Guest Lecture’ on 17th February, 2018 by Mr. Benjamin K. Ninan to provide an opportunity to students to understand the importance of organisation culture in the organisation. The session featured the presentation by resource person about the internal practices of IBM, business processes, internal communication, problem solving mechanism, decision making process, adopting innovations, motivating employees and organizing meetings. The resource person also emphasized on being ready for corporate culture as the organisations today give less time for entry level executives to settle in their job. He also said that jobs today demand high level of commitment and creativity among the employees. The session also had interaction between students and resource person, where students asked few questions regarding the current trends in organisations, job preparation and future prospects in the job market. The department has organised ‘Meet Your Alumni’ on 17th February, 2018 as part of interaction between students and alumni, which was conducted by Mr. Vinod Raj R.
Mr. Vinod Raj R has shared his experience in marketing field among the students and given an idea about the marketing. He explained about the opportunities available in the marketing field and how to grab those opportunity to build up their career. He insists the students to get into the marketing field for good package. He has given some guidelines to the students for developing their communication skills and qualities which is needed in marketing field for their better career. The session had interaction and discussed about various requirements regarding opportunities in the marketing field. Department of Management (BBA) is planned organise an expert lecture on “Design Your Future” on 8th December, 2017 for IV semester BBA students at 2.45 p.m. in Mini Auditorium-III. The session features an expert talk by Shri. Karthik Reddy, CEO, Himagiri Group, Bangalore, a renowned entrepreneur and builder from Bangalore. The session will focus on opportunities for young entrepreneurs, current challenges in family owned business and strategies for the growth of the business. The department has organised ‘Meet Your Alumni’ on 23rd September, 2017 as part of interaction between students and alumni, which was conducted by Ms. Kikayangla Longkumer which mostly focused on the importance of the CIA component which will help in students’ academic grading. She explained to the student about scoring well in the internal exams which will have impact in increasing the aggregate percentage. She focused more on placements in college which is based on the score in academics. She happily shared her college experience and about her professional experience. The department has organised a guest lecture on 23rd September, 2017 which was conducted by Ms. Tinu Joy to give learning experience about corporate culture. The department has organised ‘Meet Your Alumni’ on 16th September, 2017 as part of interaction between students and alumni, which was conducted by Mr. Sameer Ali Khan. The session has featured the orientation on career for management students in various sectors in business. The session also focused on transformation of student to corporate world and care taken to design the career. The resource person had also emphasized on utilizing the resources available in the college for the overall development of the student. He mentioned that students must learn the basic communication skills, problem solving skills, inter personal skills and right attitude to succeed in the corporate world. The Department of Management organized a guest lecture on 19th August, 2017 by Mr.V.Krishnan. He gave a session about the marketing strategies for promoting the products. 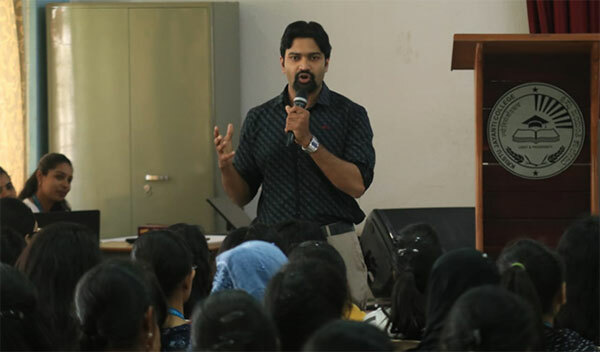 He has shared his experience in marketing field among the students and given various input for the students how to choose their career in marketing field. He differentiates about the sales and marketing concept. From the student’s perspective, he has given relevant information regarding marketing field and also, he communicated about the skills and ability required for the student to get into the marketing field to attain maximum career growth. GUEST LECTURE - "Transition to Corporate World"
The Department of Management had organized a guest lecture on 15th July, 2017 by Mr. Satheesh Kumar T.K who provided the students, knowledge about distribution strategies by the companies. The department on 18th March, 2017 had organized a Guest Lecture by Mr. Christopher D’Souza to create awareness about transition to corporate among students. The resource person had interacted with the students on various aspects related to transition of students to corporate world. The session had focused on entry level skills required for students when they get into any company. These skills include time management, communication, working in teams, decision making, problem solving and coping with emotions. The session also featured giving tips to the students on preparing themselves for corporate world through various activities conducted by department and college. He stressed upon learning and gaining knowledge from activities organised by the department and college. GUEST LECTURE - "Functioning of a company"
The Department of Management had organized a Guest Lecture on 25th February, 2017 by Mr. Nishwanth which aimed to provide information about functioning of a company. MEET YOUR ALUMNI - "Career Planning"
The department has organized ‘Meet Your Alumni’ on 21st January, 2017 as part of interaction between students and alumni, which was conducted by Ms. Deepa Chirayath to help the students to understand the career opportunities and ways to build career. GUEST LECTURE - "Role of Technology in Business"
The Department of Management had organized an interactive Guest Lecture on 7th January, 2017 conducted by Mr. Mahesha Velu and the session aimed to provide students a learning opportunity about significance of technology in business activities. MEET YOUR ALUMNI - "Career Planning "
Mr. Saravanan G., alumni of our college had visited the campus and interacted with the students on 10th December, 2016 which helped to enable the students to understand the importance of curricular and extra-curricular activities in career building. The Department of Management had organized a Guest Lecture and an interactive session by Ms. Adrienne Castellon (Instructor and Advisor, Educational Leadership, Trinity Western University, Canada) on 03rd October, 2016 which enabled the students to understand the gender discrimination issues in international context. She has shared her experience based on a research on gender discrimination at global level and its impact on women leadership. She explained that there is gender discrimination in developed countries like USA and Canada. She also pointed out that governments should draft legislation, which can minimize the discrimination among the genders. She also appealed that women must be educated and taken up responsibilities at higher levels. The Department of Management had held a Guest Lecture and an active interaction session by Mr. Amith Ravindra (Trainer, Think & Learn Pvt. Ltd., Bangalore) on 6th September, 2016 to impart knowledge about competitive examinations and preparing for the same. He has had vast knowledge in preparing students for CAT/ MAT/ GMAT. He discussed about how to solve Mathematics problems in a simple and easy way and solving the comprehensive passage with simple techniques. He also explained about different management programmes offered by B-Schools across the world. 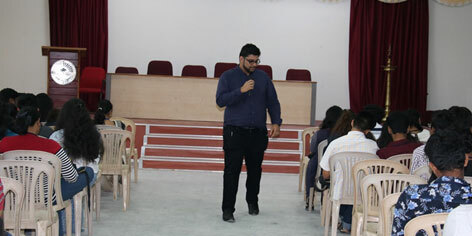 He informed the students about various scholarship options available while doing MBA programme in foreign universities. He also gave guidelines on applying for foreign universities for higher studies. Department of Management has organised a guest lecture by an alumni, Mr. John Mathai Paul (Entrepreneur, J Paul’s group, Cochin, Kerala) for I Semester BBA students on 27th August, 2016 at 10.00 a.m. in Main Auditorium of the college. The session was on “Significance of Academic Activities”. Alumni had interacted with students on various issues related to academic activities and highlighted the significance of participating in academic activities. He also had done few exercises for students to elevate the scope for entrepreneurship. The Department of Management conducted a guest lecture by Mr. Amith Ravindra (Trainer, Think & Learn Pvt. Ltd., Bangalore) on 16th August, 2016 to impart knowledge about competitive examinations and preparing for the same. Department of Management has organised a guest lecture by Mr.Shreyas B.V for I Semester BBA students on 23rd July, 2016 at 10.00 a.m. in Main Auditorium of the college. The session was on “Significance of Communication in Organisations”. The session focused on importance of effective communication in the organisation and its significance in the success of the organisation. Resource person suggested the students to be proactive and be prepared for future challenges. He also mentioned about importance of networking, updating with current affairs, learning from experiences and focusing on goals. He finally suggested students to participate actively in the activities of the department and college in order to build the confidence and develop the required skills. He also answered the questions raised by the students at the end of the session. The students have actively participated in the session and they were curious about various practices of the corporate. Students were also happy about the information shared by the resource person. 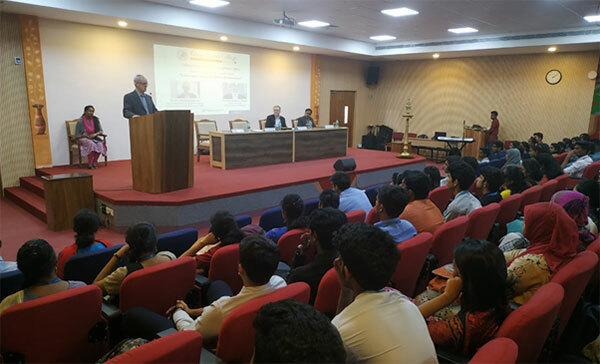 Department of Management has organized a guest lecture by Mr. Gabriel Peter (Global Sales Manager, Marriott Hotel, Bangalore) as part of the 3I programme for the IV Semester students on 13th February, 2016 at the college. The session was taken to familiarize the students with practices of star hotel in international market. He came with lot of experience in hotel industry and sheared his experience with students. The practices of hotel in international market like associating with global agencies to get customers, contributing to Indian tourism, attracting foreign customers with international facilities, providing quick information, expanding the services etc. Department of Management has organized a guest lecture by Ms. Kezhia Sharieff (Yahoo, Bangalore) as part of the 3I programme for the IV Semester students on 30th January, 2016 at the college. The session was taken to make the students understand the job-related issues in a Multinational Company.